No secret here, really. 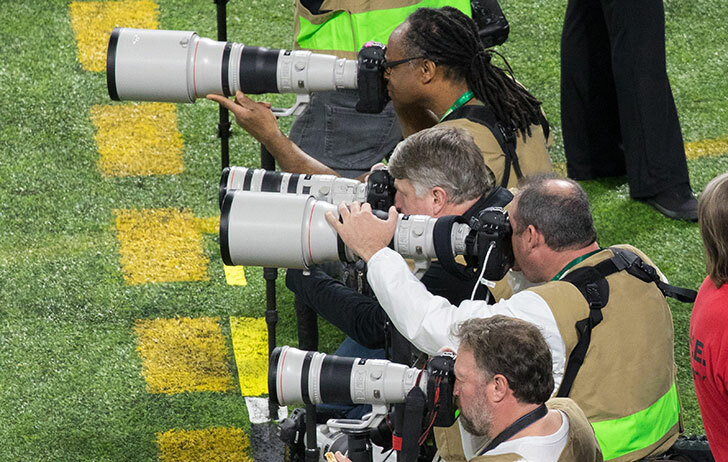 Canon sales are head and shoulder over the rest of the pack and their Super Telephoto lens and cameras once again dominated at this year's Super Bowl game. They just had a good 2017 and poised to do even better in the years ahead, leading to the finale of the Summer Olympics in 2020 in Tokyo, Japan. MELVILLE, N.Y., February 6, 2018 – In 2017, Canon U.S.A., a leader in digital imaging, was the number one selling Full-Frame Interchangeable Lens Camera (ILC)1 brand and APS-C ILC2 brand in the U.S., according to The NPD Group. Canon has been number one worldwide in these camera segments for the last 14 years, based on a global Canon survey3. February 4thshowed that 2018 is off to a great start for Canon, as top sports photographers from across the country gathered in Minnesota to cover the big game between the teams from Philadelphia and New England. An estimated 80 percent4 of the photographers in the stadium used Canon EOS DSLR cameras and EF lenses, and Canon’s iconic white lenses filled the sidelines from the opening kickoff to the final whistle. In addition to the photographers on the sidelines, Canon’s line of HD broadcast lenses were also used extensively to help deliver the game to nearly 110 million television viewers.